Black hat seo is a process to get high page rank to a web site in search engine results. This is a unethical manner in seo, many seo people will reject this type of method. By using this black hat seo process we will get good page rank in search engine results in short time period, actually this Is not recognized by search engines. Once it recognized the web site will blocked by search engines. Placing the content or keywords in web pages visible or invisible to search engine spiders or users. Black hat seo is a unethical method to to get higher pagerank in search engine result page. It only focus on human audience not search engine and it does not obey google approved guidelines for ranking. For example keyword stuffing, doorway pages etc. Thanks a lot! 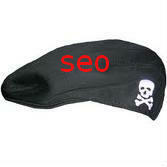 black hat should not be followed by any seo expert services to get rank in shorter period.